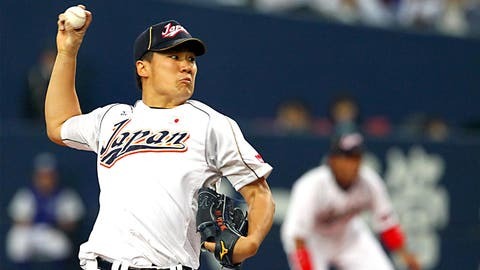 Just 25, Masahiro Tanaka is a Nippon Professional Baseball five-time All-Star. Predicting performance can be daunting for even the most skilled scouts and front office executives when scouting talent from across the world. When MLB teams start throwing money at Masahiro Tanaka, they are depending on his talent translating from Nippon Professional Baseball to MLB. We’ve seen results all over the map since Hideo Nomo became the first Japanese-born player to permanently relocate to Major League Baseball. The truth is, we really don’t know how the leap across the earth or the one of faith is going to impact a player emotionally or physically. Koji Uehara at age 24 was strikingly similar to Tanaka, who turned 25 in November. Both are listed at 6-2, and both are known for their plus, plus splits. Tanaka is recognized for his pinpoint command, Uehara was known to Americans as the "Maddux of Japan" for his ability to put the ball precisely where he wanted. The pitchers’ numbers from said age 24 season are more than comparable, see below. Uehara was unable to duplicate that dominance in NPB or in the US as a starter. He did however bank one of the greatest seasons ever as a closer for the Red Sox in 2013 with an all-time best WHIP of .565. Make no mistake, however — he was scouted as and signed for his ability to slide into a rotation, not as a high leverage reliever. I went back and looked at years of data on Japanese pitchers who’ve followed in Nomo’s giant footsteps. From a career NPB perspective, Tanaka’s numbers are unmatched through age 24. I don’t think those stats are enough, however, to accurately predict how he’ll perform here in the land of the slightly more imposing hitter. Tanaka is imperfect in the eyes of scouts that I have spoken to. He doesn’t profile physically as a top of the rotation starter like Yu Darvish. He lacks the strikeout numbers that came with Darvish as well. Tanaka’s fastball on video looks slightly flat, which would need to be overcome by extraordinary command to play at the MLB level. Flat fastballs at 93 mph get waffled by good hitters if they are anywhere near the middle of the plate. Take Daisuke Matsuzaka as a prime example. Without knowing Matsuzaka personally, I’m guessing that there was some confusion on his part over the years in the US. Manager John Farrell and the Red Sox did everything in their power to communicate effectively with Matsuzaka. "For the amount of sit-down conversations, the amount of communication that we’ve had with Daisuke, like all of our players, to ensure that there’s nothing lost in translation, even to the point of basically an open forum," Farrell told the Boston Globe in 2009. Matsuzaka never quite seemed comfortable and struggled mightily at times. Every year as Japanese players are posted, I think about the difficult trail they must trek. Gone are the comforts of a slumber in a familiar bed, recognizable culinary options and endless conversation in one’s native language. The array of differences between MLB and NPB spill between the lines. The reach is as far as the game equipment. I know from experience. 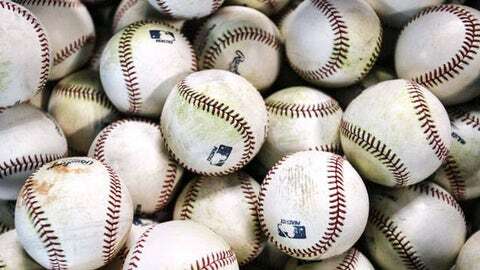 Upon my arrival to the ballpark on my first day of training camp with the Yomiuri Giants, near a black sand beach where our team hotel stood, I witnessed a staff member unwrap an official NPB ball from aluminum foil. The coach tossed the ball to me and I was floored that it was different than the balls we utilize in the States. It felt slightly smaller, lighter in weight and tackier than our official MLB rocks. The mounds in Japan are the same size as those in MLB, 18 feet around and 10 inches high. But one of my American teammates at the time told me that in Japan, many of the mounds are made of a softer, more powdery dirt. He felt like he was able to dig into this dirt more effectively. Hurlers native to the U.S. and Japan have reported that the dirt provides less resistance when dragging the back leg. And then there is life itself. Over a piping hot bowl of soba noodles and Japanese hot sauce, I sat across from my teammate Koji Uehara in the Tokyo Dome clubhouse dining area. I was failing miserably in an attempt to navigate a conversation with the superstar pitcher through my interpreter, who was attentively dining beside me. This awkward brand of conversation was familiar territory having recently completed a full spring training with the Yomiuri Giants, but it surely wasn’t getting easier. I lobbed Koji, the most impressive pitcher I witnessed while playing NPB, a random surface question in an attempt to connect with him. I waited and waited . . . and waited, as the well-intentioned translator attempted to sort out how to appropriately convey my message. By the time the answer to my question returned, the flow of the conversation had become stale. I felt defeated. My inability to connect with my teammates — which was always an essential part of the coping process as I skipped from team to team throughout my career — had taken its toll. My favorite part of baseball has always been clubhouse bonding. For that reason, coming to the ballpark was a lot less rewarding in Asia than in the US. Connecting on a human level with my teammates would have certainly eased the transition of playing baseball in a foreign country, which no doubt is a contributing factor to the bottom line of an overall experience and consequently, performance. Perhaps related, perhaps not, I struggled mightily during my short stint with the Yomiuri Giants. My responsibility, totally, not my teammates in Japan. Part of my struggles were related to the inevitable cultural difference a player encounters when competing overseas. At one point during a a particularly difficult stretch, my manager approached me with the interpreter. He wore a smile as he spoke to me in Japanese. I gazed at him, listening carefully. Our mediator translated: "I know you’re struggling. But rest assured, you’ll be in the lineup every day until you quit." This was music to my ears. Two days later, I was out of the lineup. I don’t think my manager lied to me, I simply think there were cultural nuances to that exchange that were missed by me and perhaps him. Needless to say, there wasn’t a whole lot of trust deposited in our collective bank.